- You’ll get this quest while speaking to Father in the wake of End of the Line. He gives you one final mission to carry out for the good of the Institute: taking down the Brotherhood of Steel. They’ve already tried to waste you once, so, what the hell, eh? - Track down Madison Li in Advance Systems. She’ll outline the plan for the next mission in great detail, though it’s more simple than it sounds: get in, take out generators, deliver a Synth to a bigass robot. To help this along you’ll receive three Institute Beacons which will bring in some Synth support to help you in tight situations. You may want to hotkey these. - Once you’re done with your prep, head to the teleportation room where you first entered the Institute. You’ll be zapped to Boston Airport the second you step on the pad, so make sure you’re absolutely ready. 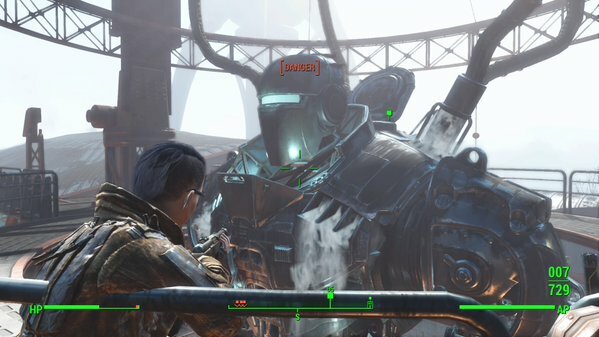 Liberty Prime, the super weapon of the Brotherhood of Steel. - Upon arrival you’ll appear in a small, abandoned warehouse on the edge of the Airport grounds. There are a few items to grab in here, but nothing special. Pop outside. - Make your way south. A heavily-guarded entrance to the Airport is on your right, but if you crouch you can avoid being spotted. Use the fallen airplanes here to hide from the BoS Knights and Scribes on patrol, and when you come within sight of a hole in the wall where the waypoint is located, scan the walls for searchlights. If you can take these out quietly, do it. Getting into a fight here is not the end of the world - but you want to avoid the main entrance if you can, as there are so many dudes over here. - The next area is a large storage room with plenty of transport crates, as well as a fair number of prowling BoS soldiers. Use the crates to keep away from patrolling guys - or just use them as cover to fire back. You should be able to make lots of noise in here without pulling in tons of soldiers from other areas. Keep your eyes open for Proctor Quinlan in here, as he’s carrying the unique Quinlan’s Armor. A Master locked door in here leads to a small area with a fair amount of ammo, as well as another Master locked door that will take you back outside. - There’s a large bank of stairs in the rear of this area that leads to the upper floor, where you’re outside. Unless it’s dark and you’re really quiet, you’ll almost certainly get spotted going up, as there’s a landing pad with a parked Vertibird here - and when the Vertibird takes off, you’ll be staring at a cluster of BoS soldiers. Chuck a grenade right at these guys and you’ll take out the Generator they were guarding, even if you don’t take out any soldiers. That’s one down. - Taking out one of the Generators will allow Synths to enter Boston Airport, and they’ll do so en masse. Sweep northwest after helping the Synths take out the Vertibird above and you’ll find another Generator at the rear of the structure on your left / right. West of this central structure is an elevator; at the top you’ll find the final Generator, guarded by a Protectron and two Turrets. Wipe out the lot with a few grenades. (Don’t freak out if you ‘see’ cloaked units during all this, they’re on your side.) Expect to run into Proctor Teagan in the process, who’s carrying Teagan’s Armor. - … and, uh, well, you’ll see. Mission complete! Surviving long enough will earn you your experience, as well as one final quest: Nuclear Family. 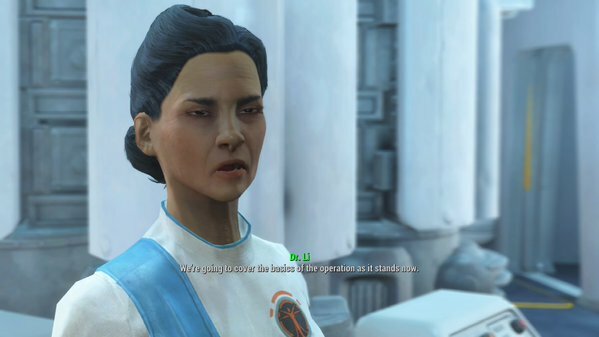 This one is short, and only requires you to speak with Father back at the Institute. Enjoy the ending! And the crapload of experience that comes with it!